Yesterday we were told we'd have all kinds of snow and ice - schools were delayed or cancelled altogether, people stayed home from work - my daughter even missed a playdate! But it turned out to be a lot of fuss over nothing much - by 10am all the ice was melted and everyone went back to their routines. 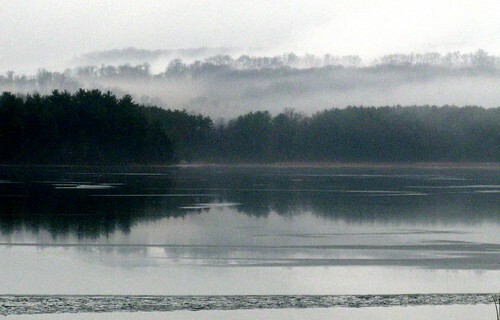 However all the precipitation did create some lovely mist over Indian Lake. By the way, I didn't mean to suggest that I baked all the cookies in yesterday's post myself - far from it! The picture was from the Sharon Historical Society's party on Saturday, and at least a dozen people contributed wonderful things, from gingerbread to mincemeat to some kind of incredible creamy chocolatey coconut thing that I will dream about til the day I die! Beautiful picture, but reminds me of a teenage horror movie I think. The content is interesting and interesting. I got the knowledge in your post today.